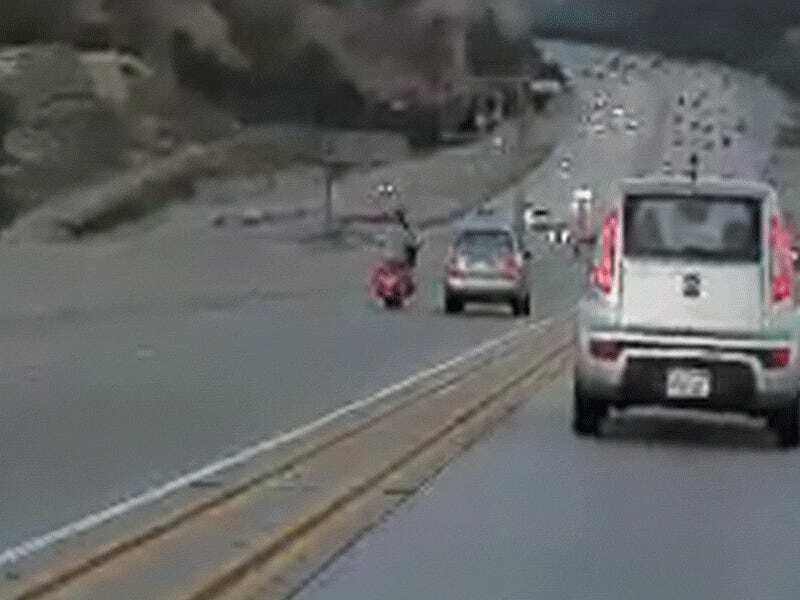 A motorcyclist kicked the side of what looks like a Nissan Sentra on a major highway in southern California, starting a chain reaction that ended with a truck on its roof and the Sentra in a mangled, leaky mess. The ridiculous crash happened near Santa Clarita just before 6 a.m. on Wednesday, NBC Los Angeles reports. The news site says a passenger in a trailing car started shooting video after the gray sedan “inadvertently” cut off the biker. After the kick, the sedan swerved towards the bike, nearly sending it into the divider. Then the car’s driver over-corrected and impacted the barrier in a huge explosion of sparks, nearly flipping the vehicle over as it careened into the center of the highway. That’s when the little sedan rammed into a white Cadillac Escalade EXT, tossing the pickup onto its roof, and injuring its passenger. California Highway Patrol told NBC Los Angeles that the man in the truck went to the hospital, but is expected to be fine. Obviously it was a road rage incident. He was kicking the vehicle. We have to get a statement, see what’s going on. 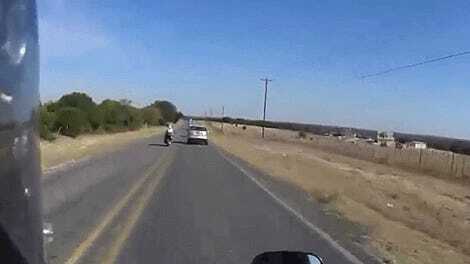 So it looks like the biker ditched—that’s a poor life choice. But not nearly as poor of a life choice as kicking a 3,000 pound moving automobile surrounded by dozens of other 3,000 pound moving automobiles. Kicking automobiles. Don’t do it. Why Are We Such Jerks Behind The Wheel?